Kiehl’s introduces the Ultra Facial Collection; three essential products to help fight winter’s dry and moisture-depleting conditions. There are two skincare sets in the Ultra Facial Collection, each containing a cleanser, toner and moisturizer. Formulated for all skin types, each product in the Ultra Facial Kits is infused with a blend of Kiehl’s classic ingredients including Squalane, Apricot Kernel Oil, Avocado Oil, and Vitamin C and E – providing moisture and hydration at every step. One thing that I like about the Kiehl’s brand, is that you consistently get good, no-nonsense products that work. Step 1 – Cleanse – Ultra Facial Cleanser is a mild cleanser specially formulated to thoroughly cleanse skin and remove make-up, without stripping skin of its natural oils. Step 2 – Tone – Ultra Facial Toner is a mild, yet effective alcohol-free toner that gently removes surface debris and any remaining residue while providing hydration and comfort to skin. Step 3 – Moisturize – One kit includes Ultra Facial Cream, a 24-hour, lightly-textured daily hydrator. Ultra Facial Cream is a richer version of the Ultra Facial Moisturizer and is designed to retain its efficacy in very cold, dry or otherwise extreme conditions. The other kit offers Ultra Facial Moisturizer SPF 15; a lotion with a light, moisturizing, texture that will leave the skin feeling smooth and conditioned after use. And yes, applying a sunscreen in the winter is still strongly recommended! The Ultra Facial Moisturizer Kit retails at $29.50 while the Ultra Facial Cream Kit retails at $24.50. The only difference in each kit is the moisturizer and that depends on personal preference–whether you prefer the texture of a cream or lotion. What’s nice is that the products are available for purchase separately, so if you’re like me, you can use the Moisturizer SPF 15 in the summer then switch to the Cream in the winter. 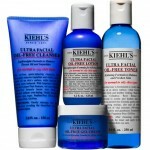 The Kiehl’s Ultra Facial Collection is available for purchase at Kiehl’s freestanding stores and online at www.kiehls.com. Make sure to check back tomorrow as the Beauty411 Skincare Jumpstart series continues! 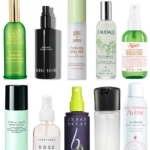 New Kiehls Ultra Facial Oil-Free Collection – Get 15% off Today!